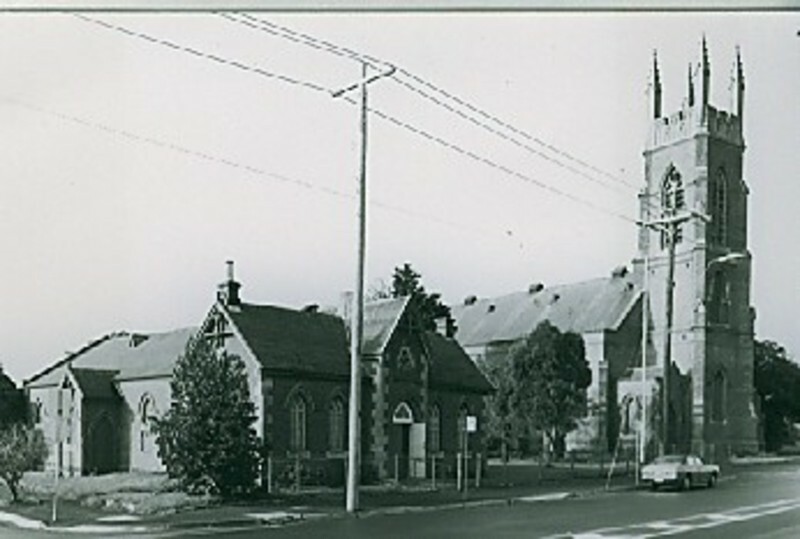 With the surging growth in Geelong in the later 1840s, the Anglican congregation felt the need for a larger church soon after completion of the small Christchurch in Moorabool Street in 1847. The next year the Government granted the site for St. Paul's, which was designed in 1849 by the noted architect, Charles Laing, who was then based in Geelong. Construction commenced in 1850, but work was soon stalled by the gold rush, when tradespeople flocked to the diggings. The first service was held in a tent erected within the incomplete Church by the first Anglican Archdeacon for Geelong, the Rev. Theodore Stretch in early 1854. The Church roof was completed soon afer, and it was officially opened in May 1854. Internal plastering was carried out in 1855, but it was not considered complete until 1863 with the extension of the chancel. These later works were under the supervision of Geelong architects, Snell and Kawerau, and Snell and Prowse respectively. A brick bell tower was added in 1865 to a design by the noted architect, Leonard Terry, then the Anglican Diocesan architect. Unusually for such an early date, the design featured face red brick rather than the more typical bluestone, but was otherwise detailed in a simple version of the Gothic Revival style. The nave is a tall rectangular design with a steeply pitched slate roof, pointed arch windows with stained glass, brick buttresses and three small porches. The slender internal timber columns supporting the boarded timber ceiling are another unusual feature and dominate the interior. The chancel features a traceried stained glass window. The tall square central tower is the most striking element of the church, featuring angled buttresses and is topped by an elaborate crenellated parapet with four corner turrets. Associated with the development of the Church are the Parish Hall, Choir Hall and Union Hall. The brick Parish Hall, originally called the Sunday School, was built in 1880 to a design by the prolific Geelong architectural firm of Alexander Davidson and Co. The brick Choir Hall was built in 1884 and was first known as the Infant School. Both Parish and Choir Hall buildings were constructed in a similar Gothic Revival style featuring brown face brick and steeply pitched slate roofs. The front portion of the Parish Hall building has a central projecting entrance gable with a trefoil opening above the doorway, and the gable ends have broad sculptural chimney breasts. These details reflect the influence on Davidson of the 19th century French architect and writer Viollet-le-Duc. They are a legacy of the Rev. Canon Chalmers, St. Paul's Church incumbent in the 1880s, who placed a great importance on religious education. The third Church Hall known as the Union Hall, was built in 1891 for the St. Paul's Church Union, an organisation that promoted the physical, mental and spiritual improvement of men in the Parish. It was designed by the well-known local architectural firm of Laird and Barlow and built of timber, with a corrugated iron roof, and simple pointed arch windows. It was relocated from elsewhere on the site to its current position in 1978. How is it Significant? St. Paul's Anglican Church and Halls have architectural significance at the State level and historic and social significance at the Local level. Why is it Significant? St. Paul's Anglican Church has architectural / historical significance for its combination of unusual features. The nave is possibly the earliest major church built in face brick and is one of the larger churches completed in Victoria by the mid 1850s. It is the earliest of only two churches in Victoria known to employ timber supporting columns to the nave and the survival of three associated 19th century halls, all in a Gothic Revival style and one quite elaborate, is also unusual. The simple almost Regency character of the interior (though dominated by the thin timber posts) is rare in Victoria. This is in contrast to the bold Early English character of the later tower, with its large plan area, stepped form and lively parapet and turrets, which forms a local landmark, and the delicate Perpendicular style tracery of the chancel window. The Parish Hall is notable for its inclusion of French Gothic Revival motifs, the trefoil window being particularly unusual, which display the influence of French architect and writer Viollet-Le-Duc. St. Paul's Anglican Church and Hall buildings are historically significant for their associations with the development of the Anglican Church in Geelong particularly the Rev. Theodore Carlos Benoni Stretch, who arrived in Geelong in 1852 and the Rev. Canon Chalmers in the 1880s. St. Paul's Anglican Church and Hall buildings have social significance as the major symbol of the faith of the Anglican community in Geelong from the mid 19th century, and the importance of faith education. The importance of music and musical tradition at St. Paul's Church is also recognised by the wider Geelong community.